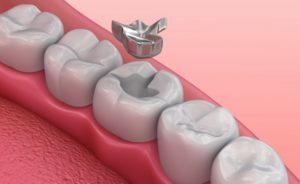 How Do Dental Fillings Fall Out? While it’s not particularly common, both dental crowns and fillings can fall out or become loose over time. In some cases, a filling may become loose because tooth decay has begun to develop inside the damaged tooth underneath the restoration. This changes the overall shape of the damaged tooth, affecting the way in which the filling fits inside the tooth. In other cases, the filling may come out while you were chewing a particularly tough substance, forcing it out of place. If your filling was very old, especially if it was hitting the 10-year mark, it may have simply been time to replace it anyway. Regardless of the circumstance, it’s always a possible situation when you have dental restorations. Does Your Filling Need Replacement? Dental fillings are ideal for restoring teeth, however, their usefulness can vary depending on how much of the tooth has become damaged. For example, if a dental filling takes up more than two-thirds of natural tooth enamel, a dental crown is a far more reasonable solution to your tooth decay. In the event that your dental filling falls out, start by applying a small amount of clove oil to your damaged tooth to reduce any discomfort. This should be followed by cleaning the inside of the filling and using a small amount of dental cement to reseat the filling temporarily. This will prevent bacteria from reaching the vulnerable inner tooth and causing problems later. Keep in mind that this should not be considered a permanent solution for your restoration. The only way to truly handle a loose dental filling is by visiting a dentist. In most cases, the filling will need to be replaced to account for new decay inside the tooth. After clearing away the decay, the dentist will take impressions of your tooth and use that mold to create a filling that properly fits your tooth. If no decay is present, replacing the filling should be a relatively simple process. Alternatively, it may be worth choosing a tooth-colored filling to replace your old filling, especially if it was metal. Tooth-colored fillings use composite resin instead of metal alloys, ensuring that it blends in more effectively with your tooth. It also does not respond to hot and cold temperatures like metal materials do, resulting in a lower risk of the filling expanding and contracting over time. Has your filling come loose? Don’t hesitate to contact a dentist about your dental emergency in Zionsville today! Dr. Angelo M. Julovich earned his DDS degree from Indiana University’s School of Dentistry. He’s fully trained to help patients restore teeth, whether they need a tooth-colored dental filling for the first time or to replace their previous one after many years. To learn more about his practice, you can contact him through his website.